No amount of rain can keep a determined golfer from teeing off, much less doing so in support of a worthy cause. 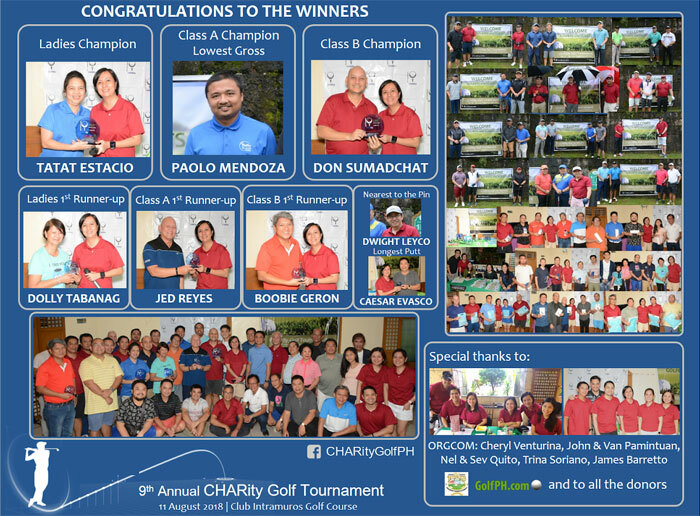 Despite the heavy rains being predicted on the weekend of August 11, 50 very game and ready players made their way to the 9th edition of the Annual CHARity Golf at the historic Intramuros Golf Course. Leading the field was the event’s founder Char Venturina in a course made particularly more challenging because of the weather. Notwithstanding the unrelenting rains throughout the morning, the flights made their way back to the clubhouse in high spirits as the after party proved to be worthy of their attendance. Participants were treated to a hearty meal, fun prizes, and a great opportunity for quality time with family and friends, old and new – all this while supporting their favorite cause. Perhaps most amazing is that for 9 consecutive years, the event has seen growing support. Tournament participants get to raise funds and the winners to eventually choose their charity to support – all the while going out under the sun (or rain!) and enjoying a round of golf. Char’s twin passions for golf and charity culminate in this annual event, making her wanting to keep on aiming for the green on both fronts so much easier. The event is going on its 10th year in 2019; hope to see you on the fairway! The 9th Annual CHARity Golf Tournament is set. And it only gets bigger and better this year. 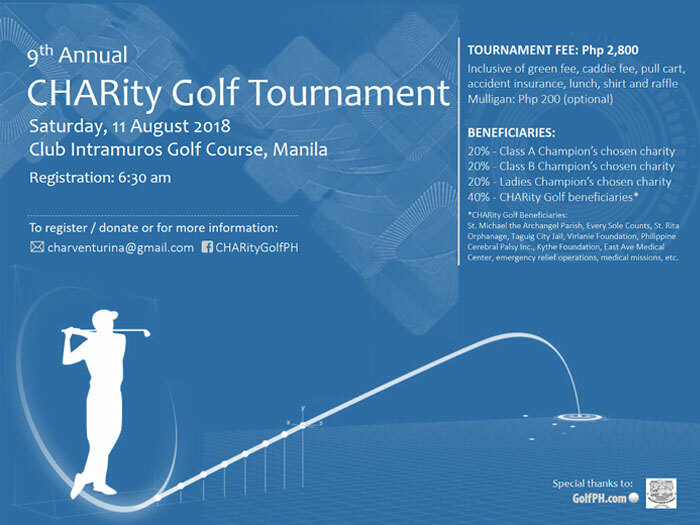 Char Venturina, tournament host and organizer, has once again gathered her team of hardworking and fun-loving family members and friends to give avid golfers another opportunity to test their skills in the picturesque par-66 Club Intramuros golf course. More important than all the golf to be played this year, all funds raised from the tournament will support new charitable efforts such as a medical mission for the caddies and staff of Club Intramuros. These are over and above the many organizations and activities that the tournament has continuously supported: the St. Michael the Archangel Parish, Every Sole Counts, St. Rita Orphanage, Taguig CityJail, Virlanie Foundation, Philippine Cerebral Palsy Inc., Kythe Foundation, East Ave Medical Center, emergency relief operations, and various medical missions. The Little Angels Orphanage in Tagaytay and Mayon evacuees through the Ateneo DReaM Team were also added as beneficiaries from last year’s proceeds. You can’t have another better (and more noble) reason to play golf on a weekend than joining this tournament! *St. Michael the Archangel Parish, Every Sole Counts, St. Rita Orphanage, Taguig City Jail, Virlanie Foundation, Philippine Cerebral Palsy Inc., Kythe Foundation, East Ave Medical Center, Little Angels Orphanage, emergency relief operations, medical missions, etc. Not a Golf player? You can still help by giving donations in cash or in kind. 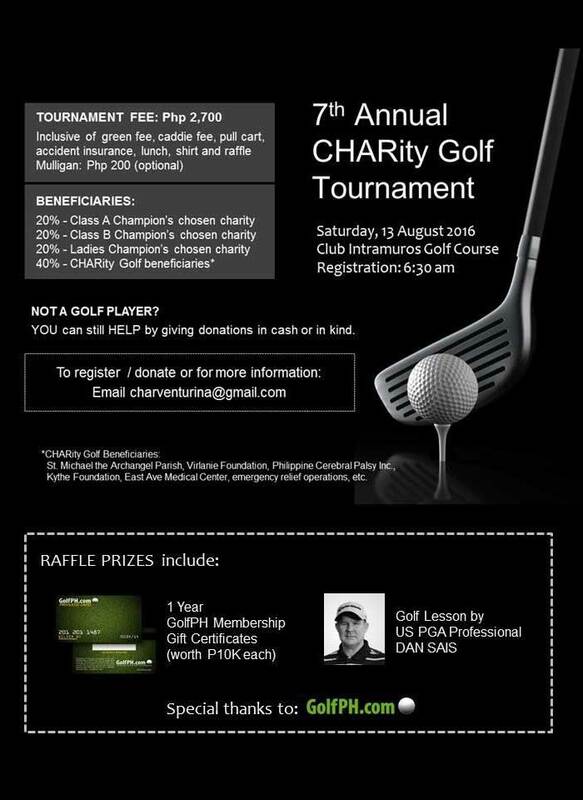 CHARity Golf Tournament is an annual game hosted and organized by Char Venturina. Venturina is a private individual who loves to help others through charity works and fundraising events. She has been into different charity works such as relief operations, back to school programs, and fundraising events like this golf tournament. 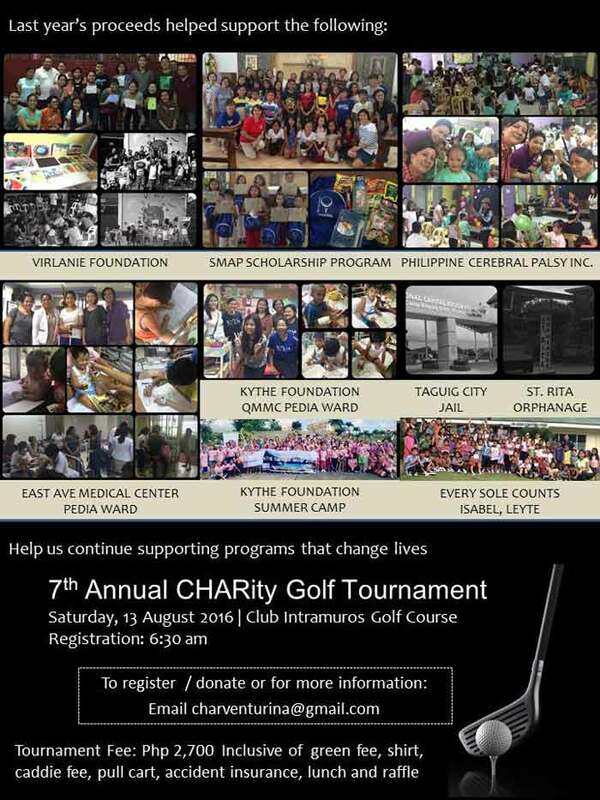 Play golf while helping others who are in need, and do charity work while enjoying. Play and join the golf tournament who’s goal is to help others which makes the game an exceptional event. We are looking forward to have you there.